David Levin, the KIPP Academy Charter School principal, talks to Education World about how the KIPP philosophy of hard work helps students achieve. In this interview, part of the Lessons from Our Nation's Schools series, Levin explains that there can be no excuses, from either the students or the adults in charge of their learning. Included: Levin talks about the teacher shortage, building relationships with parents, and the staff dedication needed to achieve success. David Levin, principal of the New York City Knowledge Is Power Program (KIPP) Academy Charter School is typically frenetic on the day Education World editors visit the school. There are 16 phone messages lined up on his desk. Stacks of just-delivered practice math test packets cover the space-starved school's conference table, and students and teachers frequently stop him to ask questions. KIPP students know that hard work is their ticket to academic success. Students are in school for nearly ten hours a day and also attend Saturday and summer sessions. The work ethos of the school has been heralded because the children deemed the least likely to succeed in our nation's schools generally score significantly higher on standardized tests compared with their at-risk peers. 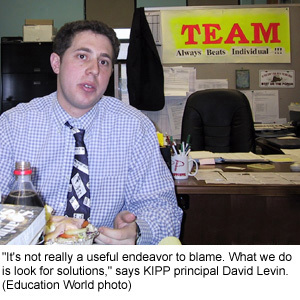 Levin and Michael Feinberg conceived the KIPP philosophy in 1992 as they traveled together to their Teach for America assignments in Houston, Texas. They co-founded the Houston and New York KIPP academies in 1995. The whirlwind around Levin slows momentarily while he grabs a few minutes over lunch to chat about KIPP, the reasons he believes it is successful, and what other educators might be able to learn from the school's successes. Education World: What do you think is the best thing you do to help compensate for the deficits students have when they enter KIPP Academy? David Levin: I think the best thing we do is offer a structured approach. 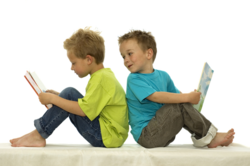 We have a structured approach to planning lessons and a structured approach to instruction and managing discipline. It all depends on the people [staff], though. We're blessed with a group of incredibly talented people -- motivated, caring, enthusiastic people. We have people who want to work injured, sick, and pregnant. That type of enthusiasm and energy is hard to find. EW: Is it tough to find teachers to work here from 7:30 to 5:00? Levin: It's tough to find teachers to work anywhere. It's not just here. Everyone struggles to find teachers. There's not a day that goes by that we're not looking for teachers. EW: So your most pressing challenge is attracting more teachers? Levin: Yes. That's the most pressing challenge for the entire system, I think. EW: How are you trying to overcome that challenge? Levin: I think we pay our teachers well. We support them well too. But it's hard. The profession is difficult. For many reasons, it is difficult to keep people in the profession. We try to address that. EW: What kind of turnover do you have? EW: How long a day do you put in? Levin: How long a day do I put in? I typically work, I don't know, 16 to 18 hours. But for me, this is an issue. If I was the CEO of Coca-Cola, you wouldn't ask the question. No one would [ask]. The reality is that people who have executive-level jobs are working those types of hours and we applaud their efforts. Yet in our case -- I understand people are trying to applaud and respect the effort I put in -- but they don't think that it's replicable. Yet every teacher who is successful, every principal, is working [long] days. There is no exception to it. That's just the way it is. If the salaries and the societal respect were commensurate with the time teachers put in, people would never look at what I do as an anomaly. EW: Aren't the goals of the CEO of Coke totally different from the goals you are trying to achieve? Levin: There are similar challenges. The CEO of Coke is trying to run a top-quality organization. I'm trying to run a top-quality school. If principals earned [CEO salaries] ... people would not look at those [long] hours and be so shocked. EW: That speaks to the teacher shortage and recruiting? Levin: Yes. Teaching is a great job. How do I say this? Teaching is a horrible job, but it is a great calling. In what other job do you have to plan your restroom breaks? In what other job do you not necessarily have access to a telephone? EW: What is the criterion for admission here? Levin: It's been first-come, first-served. This will be the first year we do it by lottery. We're basically open to any kid, but kids have to agree to the contract. Levin: Hundreds. Thousands since we started. We had more than 400 names for 60 spots in fifth grade. When people call up for spots in the older grades, we tell them in general we don't accept kids for the older grades, but many still put their names down. EW: Sounds like you don't have many kids leaving the school? Levin: Two percent includes every reason kids leave: mobility, don't like it, or expulsion. That's in a district where mobility through the schools is 28 percent. EW: How do you get parents involved? Levin: Parents have to sign a contract that they will be involved. That's a piece of paper. Our job is to make it come true. There are some kids who don't get the support they need. We still have to make it work for those students. The main way you get the parents' support is generally through the children, anyhow. We have an emerging PTA. That's not really the source for active, supportive parents, though. It's the one-on-one relationships teachers and administrators build with parents that ensure the support. Any one-on-one relationship you've got to build. It starts with the contract. But then teachers must reach out to parents. Teachers here speak to the parents constantly. Schools have this mistaken restaurant theory, I think. Sometimes they want people to come to this restaurant that serves bad food, treats people badly, and is expensive. Then you wonder who would go to a restaurant like that. It's the same with parents. If you don't treat them well and you don't offer them something that is good, why would you expect them to continually support you? At the same time, having said that, my basic KIPP philosophy arose out of the fact that a group of teachers refused to point the finger at everybody else [to explain] why kids weren't doing as well as they could. We decided to put together a program in a school to do everything we could. Having done that, I feel more comfortable in saying all the adults involved share blame for why kids in this country are lagging behind. At the same time there are solutions too, and people are really starting to look for those solutions. In general, I would resist blaming the kids. There are a few kids who could be blamed [for lagging behind], and we need to find ways and environments to help them. But the vast majority of kids are not to blame for this situation. EW: What do you blame? Levin: It's not really a useful endeavor to blame. What we do is look for solutions. But teachers have to do differently. Administrators have to do differently. Parents have to do differently. Then, if the teacher is doing differently and parents are doing their part and everyone else is doing their part -- then, if the kids are still not doing right, you can say, well, hey, the kids are responsible. We have to spend our time to make sure those things happen [so our kids learn]. EW: Describe the adversities KIPP students face in their home lives. Levin: I think these kids face tremendous external challenges. But I think [all] kids today face tremendous external challenges and [disadvantaged] kids are no exception. But we've got plenty of kids who don't have difficult situations. [It's just that] our society tends to generalize about places [such as ours]. To paint a blanket stroke is difficult, but the fact that we are located in the poorest, most violent congressional district in the nation probably paints a picture of the challenges the kids face in general. EW: What helps educators connect with children from disadvantaged backgrounds? Levin: It's how you build relationships and how people with different backgrounds work together. If you can connect with people, you connect with people. There are specific things that I've gone through that I think have been useful for working with these kids. From [my own background of] being in special education and being teased and being made fun of. ... Things do not come easily to me in many areas. I think that is helpful for me as an educator. I think understanding that can help me build the bridge. Sometimes it's the worst math students who make the best math teachers. I don't think it is necessary [to share the same background]. There are plenty of people who have backgrounds very similar to the kids' who would not necessarily connect with them as teachers. EW: How do special education students succeed in your school if they need extra help? Levin: You've got to get them the extra help they need. That's an area we're working on hard to improve. We do well. But that's an area we could -- every school -- could definitely do better on. The problem is that there is very little out there that is adequately meeting the needs of the most difficult-to-reach children. EW: Does the small size of KIPP help it be successful? Levin: Yes and no. If you're doing it with 30, you can do it better with 18. If you're not doing it with 30, you're not going to be able to do it with 18. One of the reasons we came to New York was to take away all the buts. When we were in Houston, there was, "Yes, but you're in Houston." Yes, but you're working only with these Mexican kids by and large. Yes, but! We came to New York, the South Bronx, to work with a different group of students -- and it's still working. EW: Research says that not being anonymous in a school, especially for disadvantaged students, really makes a huge difference. When we started, we had 45 kids. If a kid was late, we'd be right on the phone. We wanted to know every little detail. Now, we can't do that. We are still on the phone, and we don't really have a lateness problem because we have that culture. But still, sometimes it takes me longer than I would like to reach a parent. EW: KIPP students take part in numerous school trips, including to such places as Washington, D.C. Tell me why the school trips are so important. Levin: I think there are two reasons: One, they provide motivation so kids are excited about going and doing these things. Two, it's a reward, so it's earned. By eighth grade, about three-quarters of the kids earn [a trip] each year. But it's hard. They know clearly what the standards are, and they get reminded weekly of how they are doing. The trips also give them experiences out in the world so they broaden students' horizons. They make the kids feel confident. When people talk about Washington, when they look at the inauguration, because the kids have been there they [understand more]. There is a sense that they know what is going on. EW: How do you pay for the trips? Levin: If anyone reads this article and wants to send money to support these activities, that's what we do.